During the 2018 International Defence Exhibition and Seminar (IDEAS), which was held in Karachi, Pakistan last November, two notable Pakistani companies – Cavalier Group and Hajvairy Group – showcased their respective proposals for the armed forces’ wheeled armoured vehicle requirements. Cavalier Group brought its Hamza 6×6 armoured fighting vehicle (AFV) alongside various 4×4 options, such as the Predator 4×4 special operations vehicle (SOV) and others. Additionally, it also displayed its Pasha-line of wheeled 4×4 and 6×6 chassis/platforms for logistics and utility purposes. Hajvairy Group had brought a Kia Motors Light Tactical Vehicle (LTV). Its representatives told Quwa that it is offering the KM1 to the Pakistani security forces and, if given a sufficient order, will assemble the vehicles at Heavy Industry Taxila (HIT). 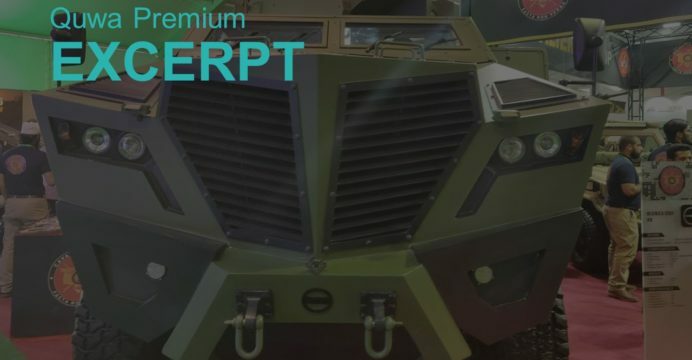 State-owned HIT revealed its first infantry fighting vehicle (IFV), the Viper, for the Pakistan Army’s next-generation tracked armoured vehicle requirements. If cleared for production, the Viper IFV will join HIT’s Dragoon 2 as among the manufacturer’s new armoured combat vehicle solutions. Overall, it appears that the armed forces are drafting armoured vehicles of varying scope and terms, and the industry is responding. On the surface, new orders would catalyze these vendors to invest and, in turn, generate long-term activity in Pakistan’s defence industry. However, the current approach – especially by the private sector – is fraught with gaps, especially in terms of the industrial intake Pakistan is to receive in order to fulfill its requirements. In other words, most plans do not have significant scope for enabling Pakistan to manufacture critical inputs, such as engines. This is not to say that these efforts will necessarily preclude such activity, but seeing how even HIT did not achieve localizing critical inputs, despite manufacturing the M113 armoured personnel carrier (APC) under license, it is unlikely that actual plans for such development, at least currently. Rather, the potential to recapitalize Pakistan’s armour will simply repeat the processes that are already in place with limited, if any, additional localization. The added cost of re-tooling combined with continuing reliance on foreign suppliers – and the hard/foreign currency cost and strategic vulnerabilities that brings – is not being dealt with aggressively enough despite repeated calls for indigenization.